Ask anyone who has ever lived in Chicago, the best thing about the city is its summer. We throw off our coats, toss our boots into the closet and celebrate the joy of being outside again. The lakefront comes alive with art fairs, parades, baseball, and hanging out at the beach. Frankly, it is why we all continue to stay here despite our brutal winters. It would not be summer in Chicago without Ravinia Festival. For those of you who have not had the pleasure, it is an annual open-air music festival, one of the oldest in the country. It is tucked away among the trees in Highland Park, 22 miles north of the city center. The name comes from the neighborhood and business district that surrounds it, which itself comes from the city’s deep ravines. View of the Pavilion, 2006. Photo by Krystyna Cygielska, with permission. Ravinia Festival is the summer home of the Chicago Symphony Orchestra. It regularly hosts such popular artists as Sting, Maroon 5, Aretha Franklin, John Mellencamp, the Moody Blues, and Sheryl Crow, to name only a few. Ravinia hosts master classes for classical musicians. Every April, we get the Ravinia calendar in the mail and ask our friends who they are going to see. It is not a question of whether you are going, it is when. Will you be sitting on the lawn, or the pavilion? Every year, Ravinia partners with the local elementary school district for a free evening of classical music. We all graduated middle school and high school inside the Ravinia pavilion. It hosts elegant galas that give back to the people of Highland Park. Ravinia Festival is and has been so integral to life in Highland Park. I was saddened to hear that it started a trademark dispute with a small brewery that was trying to set up shop nearby. 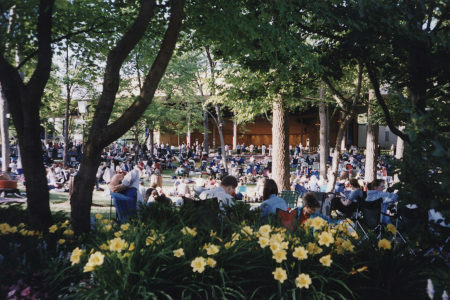 Ravinia Festival has been hosting music since 1905. More recently, it has been trying to establish itself as a fine dining destination. You can have dinner at Park View or Mirabelle, overlooking the lawn. In 2010, it applied for a trademark for restaurant services. The application stated Ravinia was offering restaurant services since 1964. Their trademark issued in 2011. At one time or another, the Ravinia neighborhood has also been home to Ravinia elementary school, Ravinia Plumbing, and Ravinia Medical Associates. The Tannebaum and Mesirow families operated Ravinia BBQ there from 1985-2015. Everyone seemed to get along fine: Ravinia Festival, and their neighbors the plumbers, the doctors, the students and the barbecue hangout. That is, until the Ravinia Brewing Company announced their intention to move into the former restaurant space and tried to trademark their beer. In February 2018, Ravinia Festival sent the brewers a licensing agreement. They demanded royalties. They claimed customers would likely confuse their restaurants with the brewery’s beer. Interestingly, the Patent & Trademark Office approved the Brewing Company’s application back in December 2015. The examining attorney reviewed the application and found no likelihood of confusion. Ravinia Festival had the chance to oppose the application, but did not do so. This letter sparked a backlash from local residents. They were looking forward to having a new place to go hang out. There has been literally a hole in the block ever since Ravinia BBQ, and now Madame Zuzu’s Tea House, closed. Brewing Company owners now had to stop and hire an attorney (not yours truly). Instead of going to buy tables, they had to go to the bargaining table. The neighborhood was confused. Why was the Festival OK with Ravinia BBQ for 30 years, but not a pub in the very same spot? 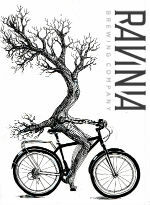 On March 13, The PTO issued Ravinia Brewing Company’s trademark. Local news media report the parties are discussing a “settlement.” I’d love to see them work this out. Stay tuned.